​The “Day in the Life” series gives an insider’s look at the professions that make South Carolina cities and towns great places to live, work and play. Municipal employees from around the state explain their role, discuss challenges they face and share stories from the unique world of municipal government service. As Anderson Police Chief Jim Stewart scribbled notes, an eighth-grade girl stared back at him skeptically. 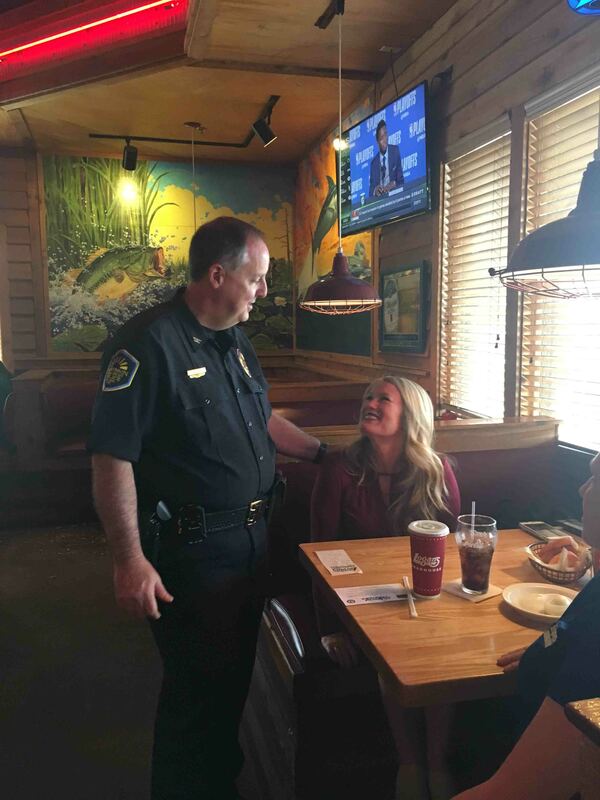 Anderson Police Chief Jim Stewart waits tables at a local restaurant as part of his resident engagement campaign. Photo: Anderson Police Department. “I don’t know why you’re writing all this down,” she told the chief, who was surrounded by alternative school students during a law enforcement listening session with local youth. “If you’re not going to take us seriously, you’re wasting your time,” the girl continued. But Stewart was paying close attention. He wanted to know what the young people thought of their local police department.